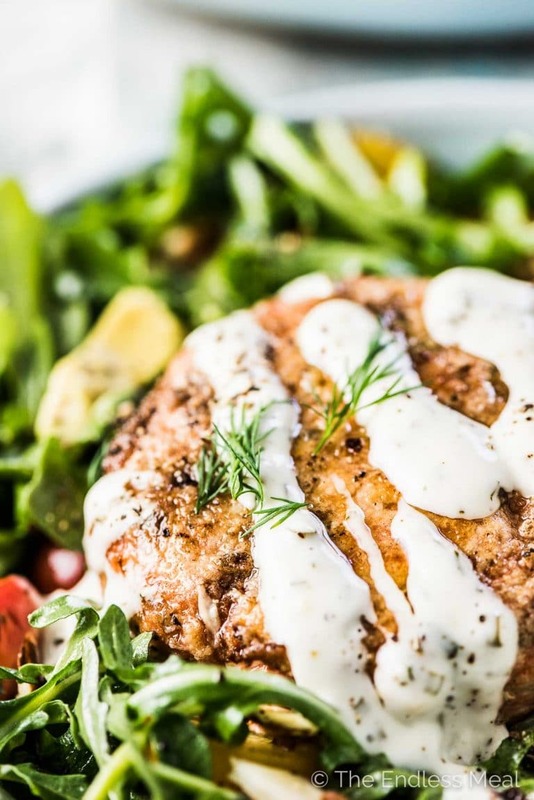 Lemon Salmon Burgers for a healthy, summer, dinnertime win! These healthy fish burgers are super easy to make and so tasty. 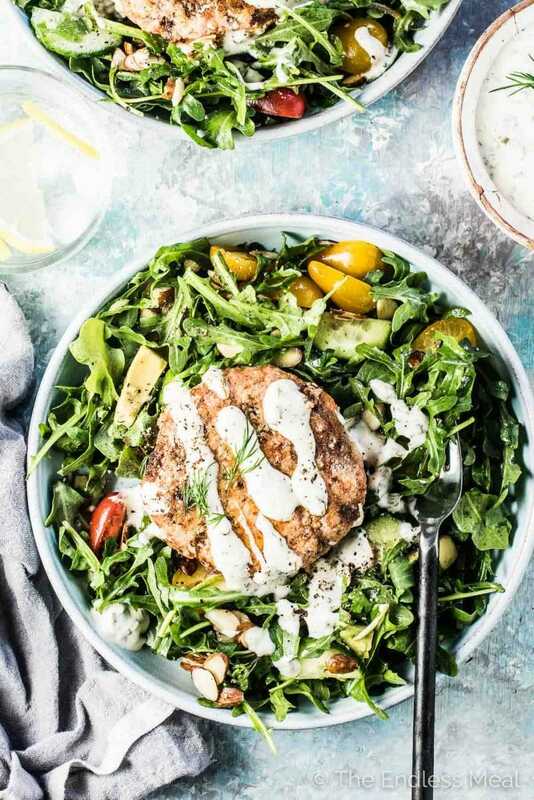 I like to serve the salmon patties on top of a big salad, but they're just as good eaten in a bun with the lemon dill sauce dolloped on top. Lemony Salmon Burgers are winning all the dinner awards! Or as my handsome man calls them, Salmon Patties on Salad. Cause ya, no bun = no burger. Only I'm a total weirdo and 90% of the time I like to skip the bun. Salmon burgers/ salmon patties/ salmon cakes … call them what you want just make sure to make them. They're made with fresh salmon because fresh is always better. They have just the right amount of spices mixed with them so that they're super flavorful while the salmon still shines. I use the smallest amount of almond flour to bind them. These burgers are all about the salmon, not a bunch of fillers. They're crispy on the outside (using a ‘secret' trick) and super tender inside. Salmon burgers = healthy burgers! These babies are super easy to make. Chop some salmon, mix in a few spices, form into patties, pop in a pan. 1, 2, 3, 4, EAT! Most of the time if a recipe says it has a crispy crust it's because it's covered in panko or breadcrumbs. I've tried several different ways to get a crispy paleo crust, and have found one way that nails it. 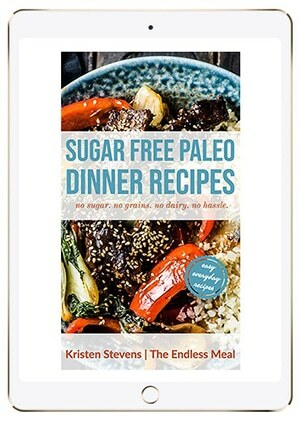 You might recognize the trick from my Paleo Honey Garlic Chicken Fingers recipe. Want to know what it is? Tapioca starch. It's almost too easy, isn't it? By coating the outside of the salmon patties in tapioca starch they get nice and crispy when they're cooked. If you're not concerned about making paleo and Whole30 salmon burgers, you can substitute cornstarch or potato starch instead. 1. Lay the salmon on a cutting board with the tail end (the small end) facing towards you. Using a very sharp knife, make a cut straight down through the flesh stopping at the skin. 2. Grab that little piece you've just cut (this can be a little tricky at first as it's pretty slippery). Turn your knife so that it is at a 45-degree angle to the cutting board. Pull that little piece towards you while slowly moving your knife back and forth while pushing the knife away from you. 3. As the skin comes away, pull it to one side and make sure to keep it taut. Adjust your grip on the skin so that you are holding it close to the knife to make it easier. 4. That's it! You've just skinned your salmon fillet! Can you make your salmon burgers in a food processor? Technically, yes. But I'd really love it if you would try chopping the salmon by hand. At least once. It really does make the best salmon burgers. When you use a food processor, the salmon turns into a paste. Even if you're really careful not to over process it, it will always be a bit paste-like. We don't want that. Depending on how savvy you are with a knife, it should take about 5-10 minutes to finely chop the salmon by hand. If you factor in the time it takes to dig out your food processor and wash all the finicky little parts on it after, you might even save time chopping the salmon by hand. By chopping the salmon the old fashioned way, you get salmon burgers that are lighter in texture. In this case, lighter = better. Lemony Salmon Burgers for a healthy, summer, dinnertime win! These healthy fish burgers are super easy to make and so tasty. I like to serve the salmon patties on top of a big salad, but they're just as good eaten in a bun with the lemon dill sauce dolloped on top. 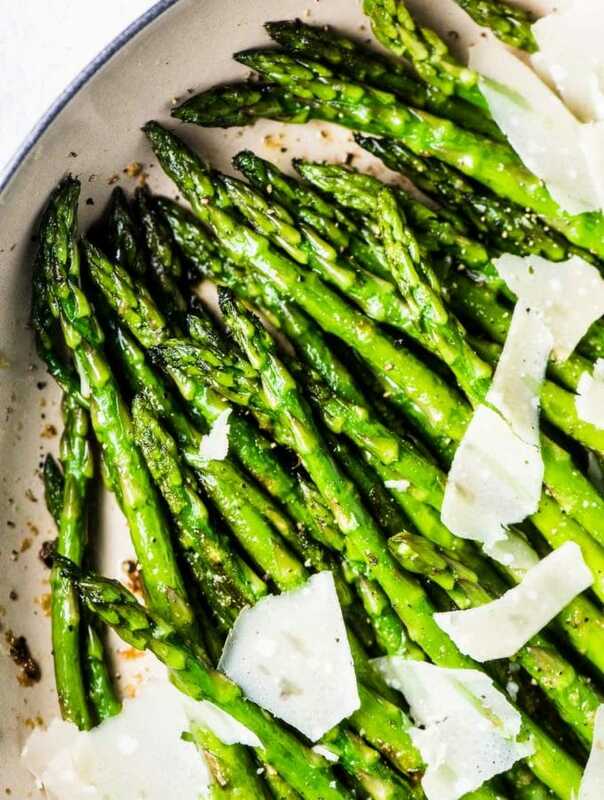 Mix all of the Lemon Dill Sauce ingredients together in a small bowl and refrigerate until serving. 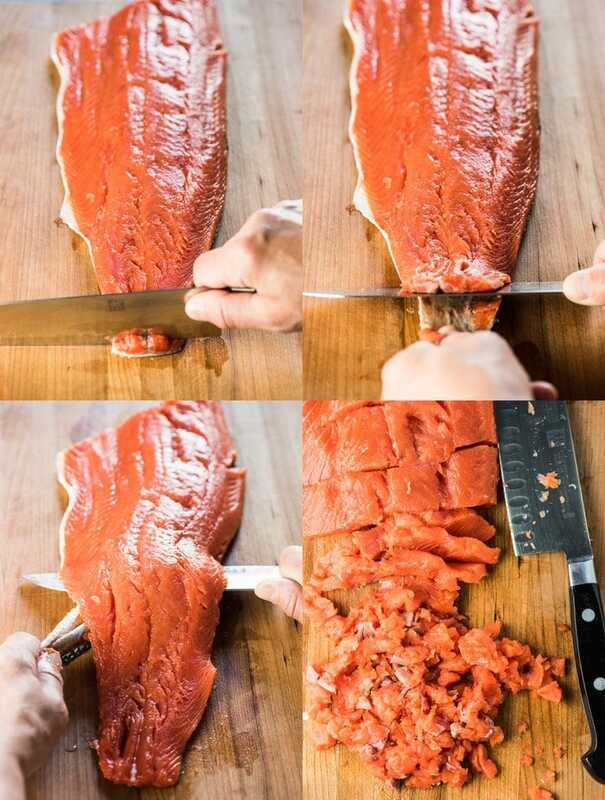 Chop the salmon by hand by cutting it into thin strips then chop the strips into the smallest pieces you can. 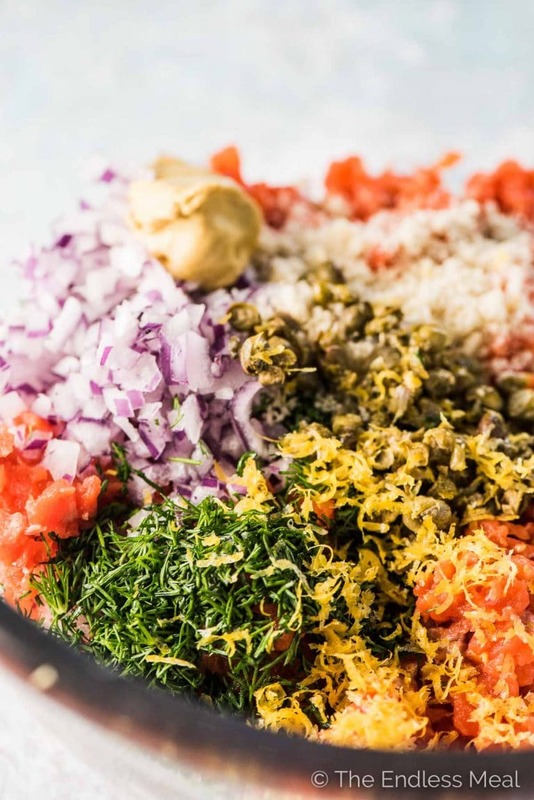 Place the chopped salmon in a bowl and add the red onion, mustard, dill, almond flour, capers, salt, and pepper. Mix thoroughly then shape the salmon into 4 patties. Place the tapioca starch in a low sided bowl then dip the salmon patties into it so they are completely covered. Heat a splash of oil in a non-stick frying pan over medium-high heat. Once the pan is hot, add the salmon patties. Cook them for 4 minutes then carefully flip them over and cook for 4 more minutes on the other side. 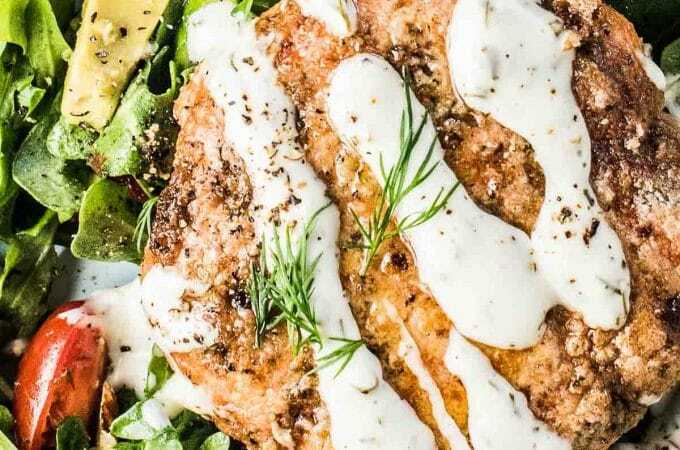 Serve the salmon burgers with the Lemon Dill Sauce over top. 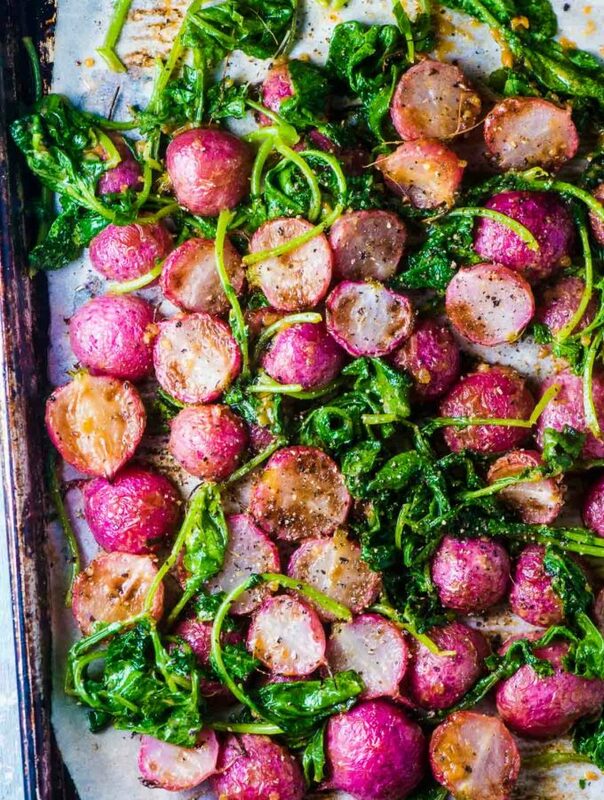 You can substitute some or all of the mayonnaise for thick Greek-style yogurt for a more tangy sauce. You can use a food processor to chop the salmon, but chopping it by hand gives the best results. Pin these lemon salmon burgers to save for later! Hi there! Would this still work if I leave out the tablespoon of almond flour? Just made this. My wife said it was a 12 out of 10. I agree. I’d put half the amount of juice in the sauce, but otherwise a top recipe. That’s such a great compliment! I’m so happy you both liked them!! These burgers are so good! Chopping the salmon by hand was a lot easier than I thought it would be and it does seem to make them more tender. We will be making these again! I’m so happy to hear you gave hand chopping the salmon a go! It really is better, isn’t it?! I adore everything about these! And you fillet your own salmon? You’re my hero. Thanks, girl!! I used to be scared of filleting fish until I had a chef show me how. Once you do it a couple of times it becomes really easy!